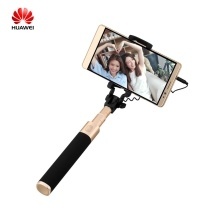 The Huawei Selfie Stick AF11 with CNC-crafted aluminum rod and 128g of weight, just press a button to shooting your beauty in different angles via 270 degree adjustable head, and it is compatible with all phones running EMUI 2.3 or later, iOS 5.0 or later, and Android 4.3 or later. – 270 degree adjustable head captures you beauty in different angles. – Dual-clamp design and sturdy aluminum rod, to keep your phone secure and stable. – Aluminum rod can be extended from 18 cm to 66cm – enough length for shooting various scenarios. – Just press a button to take a photo, easy to use. – Weighing just about 118g and collapsible to 18cm, well fitting into your bags. – CNC-crafted aluminum rod protects against rust and discoloration. – Compatible with all phones running EMUI 2.3 or later, iOS 5.0 or later, and Android 4.3 or later.